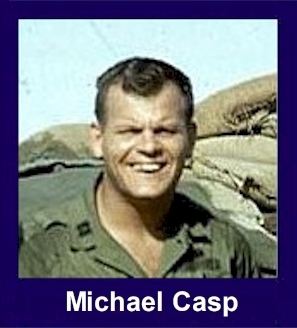 The 35th Infantry Regiment Association salutes our fallen brother, CPT Michael Allen Casp, who died in the service of his country on November 14th, 1967 in Quang Tin Province, Vietnam. The cause of death was listed as Helicopter Crash. At the time of his death Michael was 27 years of age. He was from Beaver, Pennsylvania. Michael is honored on the Vietnam Veterans Memorial at Panel 29E, Line 94. The decorations earned by CPT Michael Allen Casp include: the Parachute Badge, the Distinguished Flying Cross, the Bronze Star, the Purple Heart, the National Defense Service Medal, the Vietnam Service Medal, the Vietnam Campaign Medal and the Vietnam Cross of Gallantry with Palm Unit Citation. Captain Casp was the Commander of A Battery, 2/9th Artillery. He was temporarily filling-in for the regular LNO whom was on R&R.